Behind this door sits a world of pure wonderment! 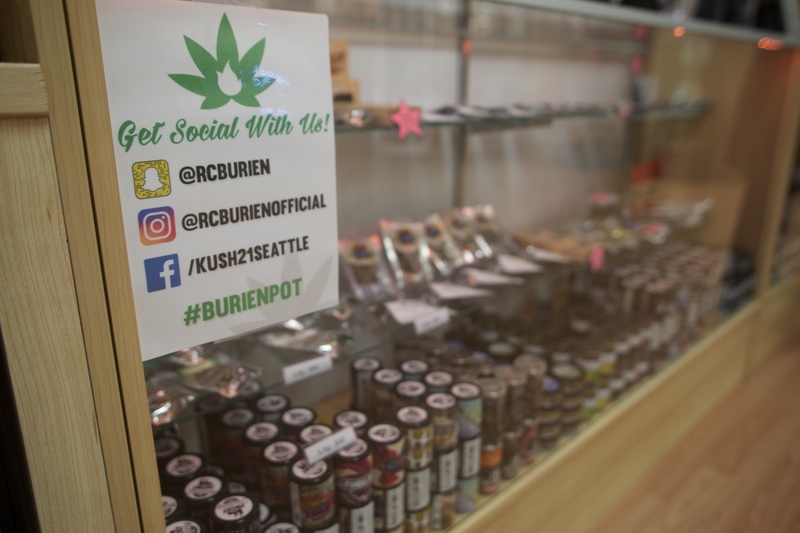 Sitting about 5 minutes away from SeaTac Airport in Burien, Kush 21 may be the most convenient recreational marijuana retail shop for travelers looking to experience all the joys legal cannabis can offer. The shop itself sits in a strip mall, which is nice because there is ample free off street parking available to customers. The first thing customers notice after having their ID checked and walking into the shop is the huge amount of selection they offer. From the outside, the space looks much more cramped than it actually is. Once inside, I was able to walk around the expansive facility and take in all of the options in wonder. Budtenders are always excited to see you at Kush 21! appreciated greatly. 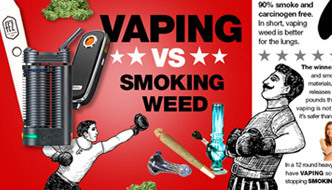 You know those times when as a customer you can tell that the budtenders at certain shops are pushing inferior products to try to get rid of inventory? That was definitely not the case here. 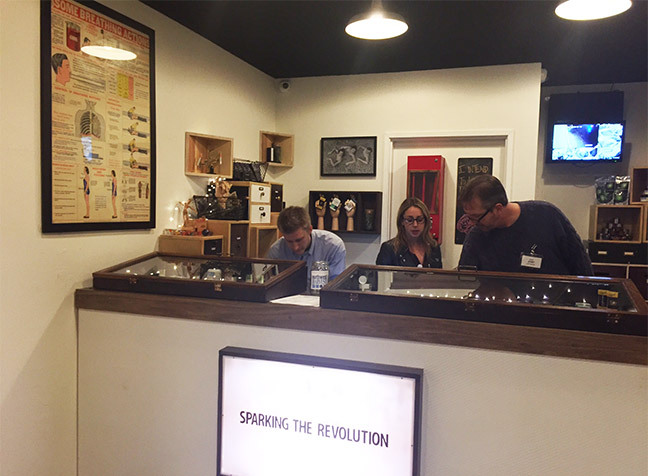 The staff patiently asked many pertinent questions and tried to cultivate the highest quality cannabis experience for me, and they seemed genuinely excited to do it! The shop has a wonderful layout where they organize their products into different categories so that customers can easily find what they are looking for. 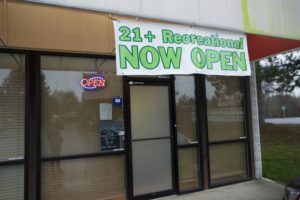 For example, they have all of their edibles and topicals on one side of the shop, and all flowers are broken down by either Sativa, Indica, or Hybrid. This simple organization system made perusing their offerings more simple than at some other shops. Gotta love having so many options! Another thing that is made abundantly clear is how much they care about their customers at Kush 21. They strive to ensure that each person that walks through the door is treated to the highest level of customer service imaginable, and walks back out the door in better spirits than when they walked in. Also, the shop goes to great lengths to ensure that their customers keep coming back anxiously time after time. They update an online menu daily so that their products are available to view online so that you can know what’s available to you before even stepping foot in the shop! Also, they have a customer loyalty program that provides members with new product alerts when new items hit the shelves, and also offers generous discounts for those who return often. Who doesn’t love saving a few bucks just for making your purchases at the same wonderful location? The shop’s staff was wonderful and super helpful! Kush 21 is a one-stop shop for all your marijuana related needs and is a great place to shop! I can say with a certainty that I will return to this store, even if it isn’t the most conveniently located for where I live. I really enjoyed the atmosphere in the shop, and the budtenders’ willingness to help steer me in the right direction really impressed me. I ended up buying a few grams of a few different strains, and not only were their descriptions of the products absolutely on point, but they also were items that I likely wouldn’t have picked out on my own. I love trying new things, and was definitely not let down in any sense by Kush 21. Come check out the shop the next time you are in Burien, or are looking to try a new shop. They’ve got everything you need, and tons of stuff that you didn’t yet know you needed, but now can’t live without! 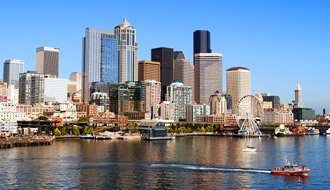 For more information on Washington state Recreational Marijuana Retail Locations, click here for our full directory! 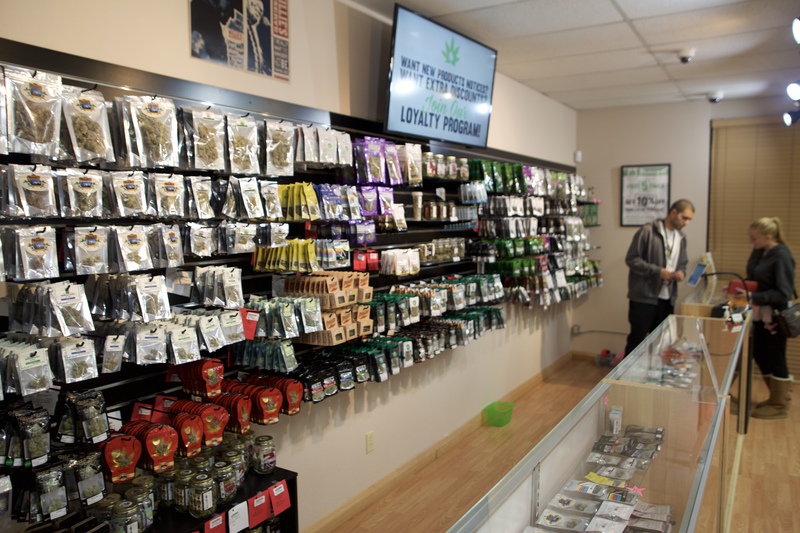 On Monday, the City Council voted to make buffer zones smaller for marijuana retail stores. Previously, the state law required a 1,000 foot buffer. The buffer has been reduced to 500 feet from certain establishments such as daycares, parks, etc. 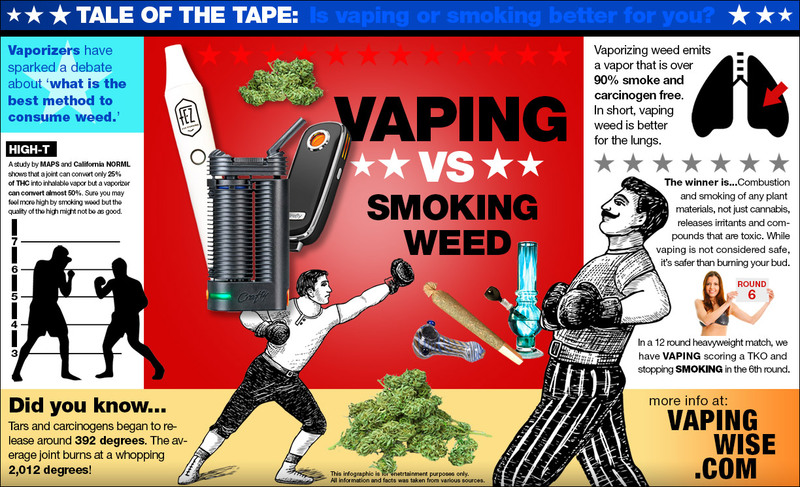 The 1,000 foot buffer between schools and pot shops stays in effect. The buffer is reduced even further to 250 feet in downtown. This will make it easier for visitors to the city to purchase marijuana instead of trekking to other parts of the city. It is sometimes ridiculous and unbelievable, the stuff that gets published. Unfortunately, there is not enough accountability for blatant and potentially dangerous misinformation. We can forgive them for the first statement. 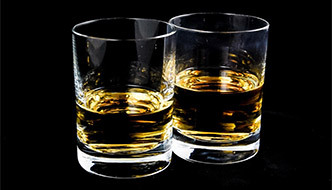 Maybe they didn’t do their research, or even just a quick Google search to find out that alcohol also contains a chemical known as Carbon Dioxide. UPDATE: Make sure you check out Ruckus this Saturday at noon. They will have a little shindig which includes a harp player sitting on a toilet. Can you believe it? 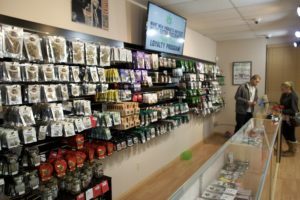 Capitol Hill finally gets a recreational marijuana store! Amidst the ever changing gentrified (Sodo Sopa) landscape of Capitol Hill in Seattle, a new store has emerged to shake things up a little bit. 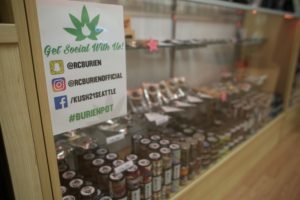 Ruckus, a small, curious, recreational marijuana store, owned by Sam Burke, is located next door to a US postal service on 15th and Republican. This is great news as it gives the densest neighborhood in Seattle an option when purchasing legal weed. Contrary to its’ name, the first impression of Ruckus is calm and peaceful. But don’t let that vibe fool you. Underneath it all, are little intricacies and curiosities, that make this pot shop loud. 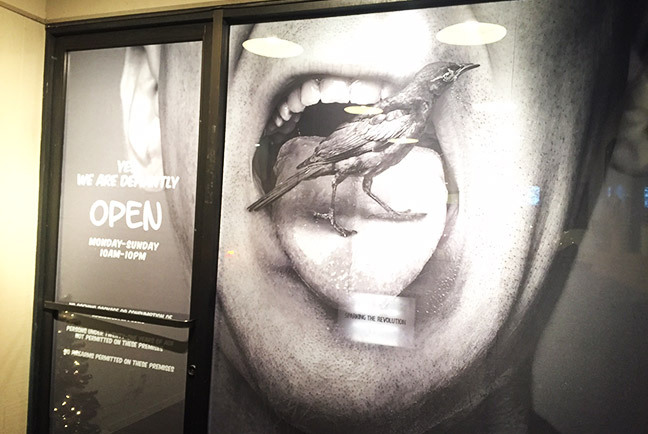 Ie., the image of a bird perched on a tongue as you walk in, little contraptions placed around the store such as a magnify glass, wooden artist figures, a vintage looking poster that reminds you how to breathe, and wooden artist hands holding products. 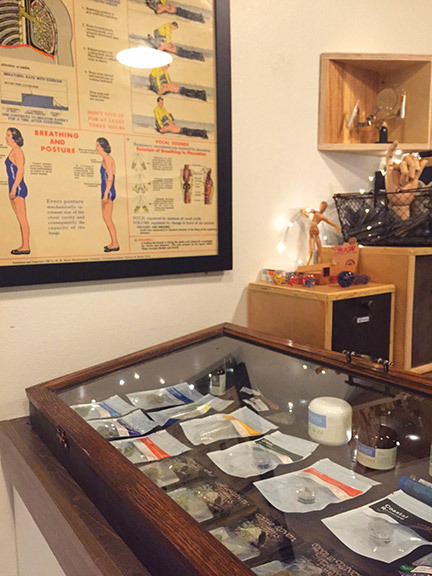 Marijuana products such as flower, pre-rolled joints, oils, and edibles are placed carefully behind vintage wood/glass display cases that sit on the counter. A few products and glass pipes are displayed in various places behind the counter. 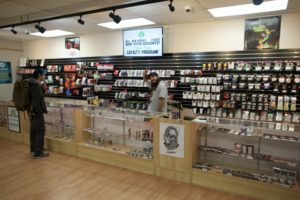 The setup has a general store vibe, where there is one counter, the selection is simple, and the interaction with the budtender is very personable. Ruckus is open from 10am-10pm Monday thru Sunday.